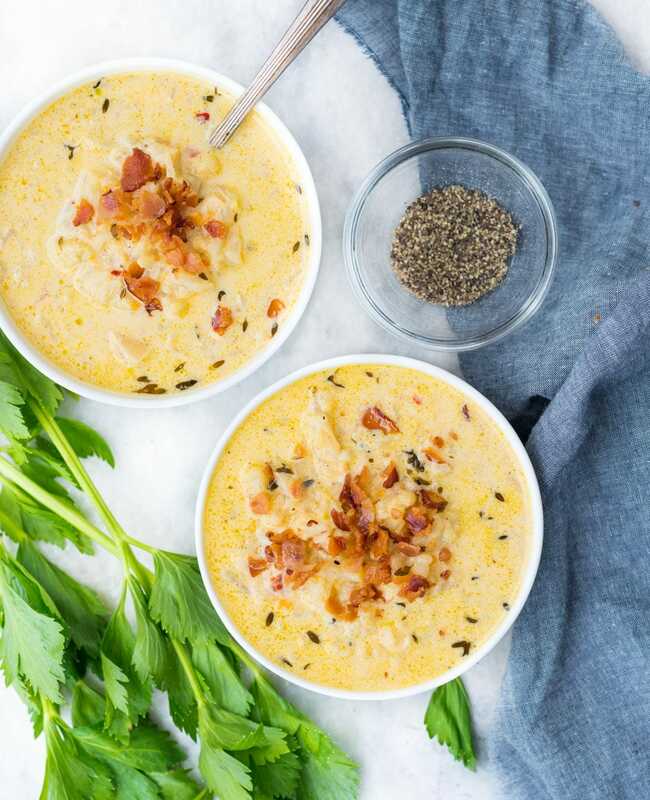 Creamy and Healthy Cauliflower Soup loaded with bacon and Cheese is low carb and Keto. I am labelling this as one of the best Cauliflower recipes to date. When there is bacon in a soup, nothing can go wrong, right? One of my favourite soups because it is rich, creamy yet not loaded with cream or Cheese. Cauliflower, when cooked, makes the soup naturally creamy. So you can adjust the amount of cream and cheese as per your preference and how rich you want the soup to be. 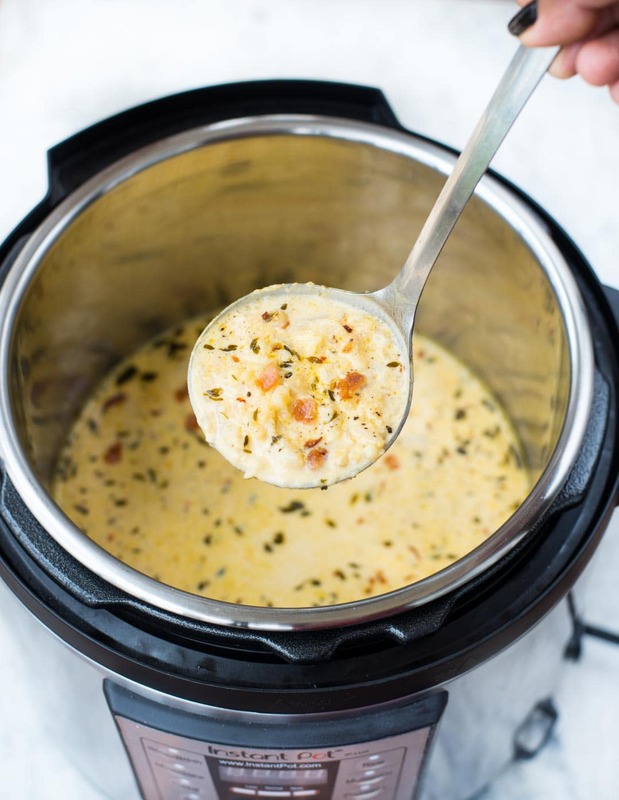 Another Instant Pot recipe and also a Soup recipe. Honestly, I didn’t want to spam you guys with soup recipes one after another. But this soup turned out to be so amazing, that I had to share here without any delay. It is perfectly creamy, thick and really satisfying. 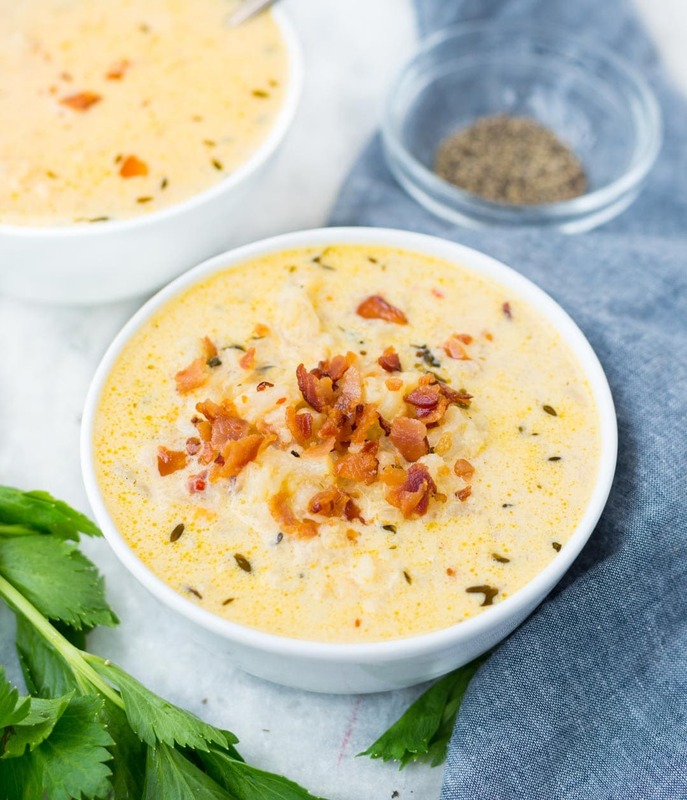 This easy Cauliflower Soup needs a handful of ingredients and is very much customizable as per your taste. Start with a fresh head of cauliflower, clean and cut into florets. You could also use frozen cauliflower florets, you can’t get hold of fresh cauliflower. I love to use butter to saute Onion and garlic. You can substitute with Olive oil if you prefer. Thyme and Bay leaf are the aromatics used. Try adding Parsley or Oregano can also be added. But try not to go overboard with herbs. Then there is Bacon and it makes everything better. 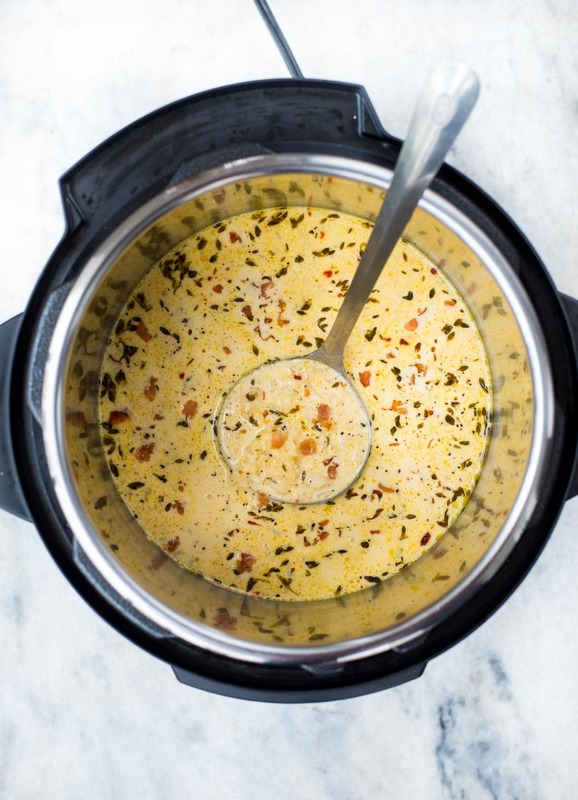 Cream and Cheddar helps to thicken the soup. Here is the best part of this Cauliflower Soup. You can adjust the quantity of cream and cheese in the soup as per your taste or calorie requirement. Cauliflower, when cooked, makes thickens the soup naturally. So you don’t need gallons of cream or cheese to make it thick. I like to keep little chunks of cauliflowers in the soup rather than a smooth case. Use a hand blender to blend it to silky smooth consistency. Being low on carb, Cauliflower is quite popular among people who are trying to lose weight. It is also an excellent source of Vitamin C, Vitamin K, Dietary Fiber, and other nutrients. It is also one of those versatile vegetables, that can be used in many different ways. A popular substitute to starchy food items such as rice, Potato. One of my favourites is this creamy Cauliflower Coconut Curry. If you follow Keto/Low carb then you must check this delicious Chicken and Cauliflower Rice. 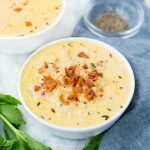 Because Cauliflower makes this soup naturally creamy, you can totally reduce Cream and/or Cheese as per your preference. Omg .. so delicious .. I was literally salivating.. Came out great!! I did substitute heavy cream. Really delicious. I did mine on the stove as I don’t have a crock pot. Please tell me there aren’t 17 grams of carbs in each serving of this wonderful soup! It just seems more like entire head of cauliflower, not per serving. 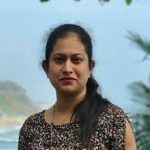 I am on keto, so if ths is coreect, it pretty much takes it out of the game while trying to lose weight. Please confirm. The nutritional value given in the recipe is for 200 grams of serving. It is not only the cauliflower that has carbs. The tool is considering carbs from Onion,cheese, Cream and the stock. So you can adjust the the ingredients as per your macro requirement. Hope that helps. I used real bacon bits instead of sliced bacon and it tasted amazing and dropped the calorie count to 232! So good! I had some carrots that needed to be used so I shredded 2 large carrots and added them with the cauliflower. I cooked the bacon without knowing it was for garnish so I chopped it up and added it in with the cheese and threw it all in the blender. I think blending really made it an awesome texture (butternut squash-like) and really improved the soup for me as I love thick soups. Will definitely be making this again! Adding carrot is a good idea. Glad that you liked it.